Have you ever had an experience that seems extra-ordinary? I mean, have you ever had a series of events that seems too coincidental to just be reality? Whoa...Nerdy April is about to get deep, so hold on! I met the BF on a whim. Seriously, a complete whim. Here are the series of events that led to "the meet-up". Yes, it was a complete whim, however, I would venture to say it was perfect. Of course our relationship was slightly "long-distance" for about 2.5 years, well I guess only 2 if you count my internship last summer at the Marshall Space Flight Center, but it has been completely worth it. Ok, enough mushy, back to the coincidences. It just so happens that the BF's lil bro is friends with a girl whose dad was the director of the Marshall Space Flight Center. And it just so happens that he found out how much I love space and want to be an astronaut. 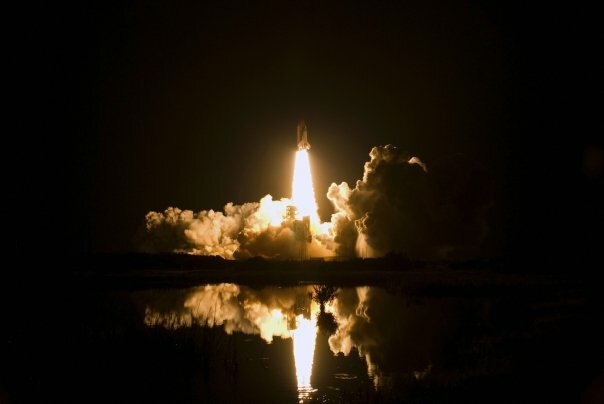 And it just so happens, he invited us on a VIP expedition to see the launch of STS-123 in March of 2008. 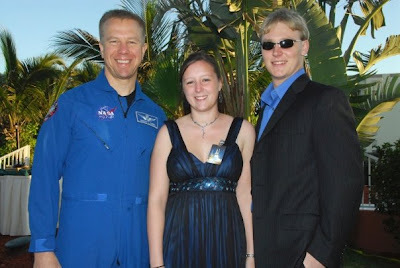 Ok, as if that wasn't awesome enough, we were also invited to attend a pre-launch VIP hang-out of sorts with important people in fancy clothes, and an astronaut...although the astronaut we met wasn't really an astronaut yet, his name was Tim Kopra. I was so excited to chat with him and find out who I need to pay to be an astronaut...haha, but seriously. He was a very humble man and was just as eager to divulge his astro-secrets to this young, aspiring astronaut. I am a thorough person, and so, upon returning to Arizona after the most awesome weekend of my life, I promptly looked up Mr. Kopra in an attempt to learn more about the man I recently rubbed astro-shoulders with at a par-tay! Nothing in his background stood out to me then. He was just a normal military guy, destined for a flight into space (jealous!). Well, time went by, Mr. Kopra did fly in space, in fact he hung out in the International Space Station for a while, and I was excited when I heard about him finally getting his astronaut wings. A little while later I was about to graduate college with an Aerospace Engineering degree, and I was searching for a sweet job. Where did I end up? None other than the Army's own Flight Test Directorate here in Huntsville, AL. You may be thinking, "Who cares about your stupid job, Nerdy April?...its not like flying on helicopters or taking data is cool or anything...psshhhhh." My friends, it just so happens (I feel like I have typed that a million times by now) that Mr. Kopra is getting another ride in space...on the second-to-the-last space shuttle mission...STS-133. So, I decided to refresh my memory about his background (what can I say, I am obsessed). As I started re-reading his experience, I noticed some key words, "Fort Campbell", "U.S. Naval Test Pilot School", "U.S. Army Aviation Technical Test Center"....WAIT...WHAT?!?!? Yes, ATTC was the old acronym for my group...Army Aviation Flight Test Directorate (AFTD). Holy crap, this guy was in the same area of the Army as me! Although, he worked on the Comanche program (likely down south), it is still amazing to me. Little old wanna-be-astronaut Tim Kopra from the STS-123 launch party, was nearly my peer now, not to mention a full-blown, legit Astronaut! Coincidences: events to show you that you are on the right track. Thanks Tim.